Division of property is usually a central issue in any divorce. California is one of just a handful of states that follow the community property rule when it comes to asset division in marriages. In California, everything a married couple owns is either community property or separate property. State law defines community property as "any asset acquired or income earned by a married person while living with his or her spouse." Separate property includes assets the person owned before marriage or assets received as a gift or inheritance. When the marriage ends due to separation or divorce, community property is divided equally between the spouses unless they signed a contract, known as an antenuptial or prenuptial agreement, to the contrary. When two people live together, it can be difficult to maintain completely separate finances. Despite the best efforts, assets inevitably mix. What started out as separate assets leak over to marital assets. "Commingling" occurs when separate property mixes with marital property. Courts in California have held that separate funds that have commingled with marital funds automatically become community property unless they can be traced. To trace funds, a spouse must be able to supply the court with bank records or receipts. Community property is not as straightforward as dividing everything right in half. In a divorce, the court calculates the fair market value of the couple's marital assets and subtracts their debts. Rather than dividing each asset equally, the law simply states that each spouse must receive an "in kind" contribution. This means that as long as the value of the assets given to each spouse are equal, they can divide their property in a way that makes sense to them. This may mean that one person retains the title to the matrimonial home, while the other person gets to keep a vacation property and the couple's investments or a business. The California courts suggest using the Schedule of Assets and Debts as a starting point in figuring out the total value of your marital assets. Although this form doesn't get filed with the court, California law requires each spouse to submit it to the opposing party. Both husband and wife must list all community and separate property, along with living expenses and debts. The form helps individuals identify the fair market value of each asset. With this method of determining the value of a pension plan, an actuary is brought in to calculate its present value. The actuary examines the pension plan description, along with how much the value of the pension plan has changed since the contributing spouse started the plan. The contributing spouse is credited with the value of the pension plan when community property is calculated. This method of dividing a pension plan works a little differently from the cash out method. With a reservation of jurisdiction, the non-contributing spouse is entitled to a monthly payment from the pension plan when his or her former spouse retires. The amount of the payment from the pension plan depends on how long the couple were married, as well as how long the contributing spouse put money in the plan. 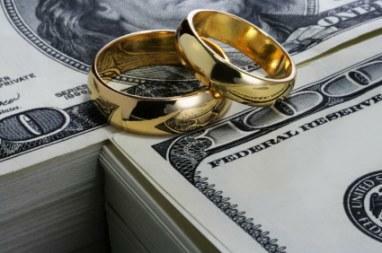 The court calculates the payment by dividing years of marriage by years of plan participation. For example, in a case where the husband contributed to a pension plan for 20 years, with 10 of those years concurrent with his marriage, the community property portion of his plan is 50 percent (10 divided by 20). Thus, the wife is entitled to 25% of his retirement benefit (half of 50 percent). Although it can be a stressful process, settling on a satisfactory division of all your marital property can give you a sense of closure. Once you and your spouse have divided all your community property, you can finalize your divorce and move on with your lives.